You've probably heard the term brining during the Thanksgiving season. Commonly seen when preparing turkey, it's a process where meat is soaked in a brine (read: salty water) before cooking. This recipe also calls for brining. In fact, the chicken wings are brined for a brief moment before marinating in a mixture of oil, garlic, dried herbs, crushed red pepper and lemon juice. After a few hours of marinating, it was on to the fryer with the wings. 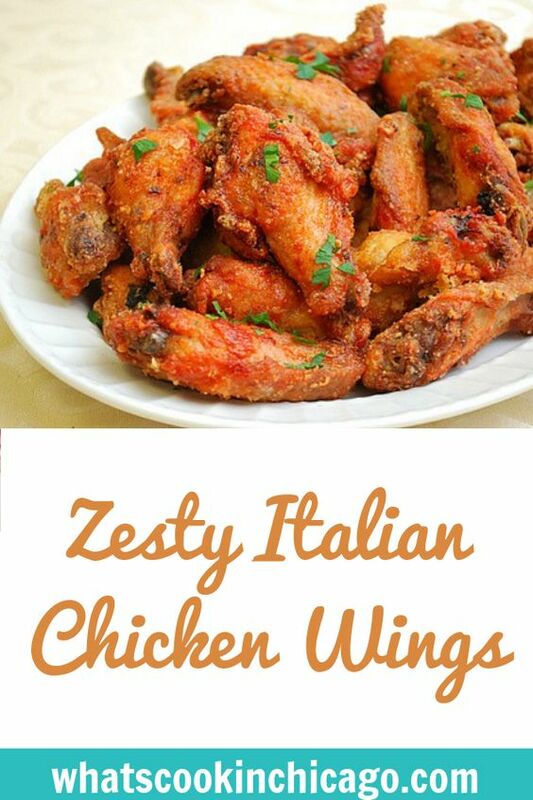 These were definitely zesty, crispy and a great alternative to the usual buffalo hot wing! For the marinade, heat the oil and garlic until warm. Add herbs, crushed red pepper, lemon juice and salt. Mix and set aside. In a large pot, combine hot water and honey until dissolved. Add the cold water and salt and stir until most of the salt has dissolved. Add the chicken wings and brine for 30 minutes. Remove wings from brine and place on a cooling rack set over a sheet pan. Let wings dry thoroughly, patting with paper towels if necessary. Reserve 2 tablespoons of the marinade for later and pour the rest in a gallon-sized zipper freezer bag. Add the wings. Seal the bag tightly. Gently massage the marinade around all the wings. Place bag in fridge for several hours, or overnight. Preheat deep fryer or large dutch oven with oil. Oil should be heated to 350 degrees for frying. At the same time, preheat oven to 200 degrees. Remove bag of wings from fridge while oven is preheating. Toss and coat marinated chicken in cornstarch. 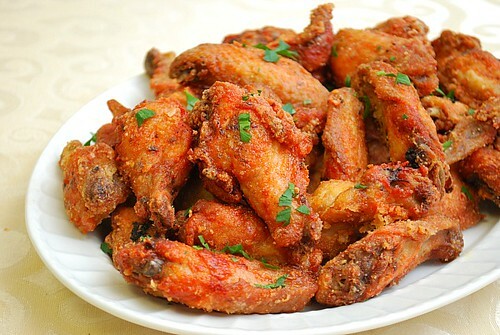 Once oil is hot enough for frying, place a few chicken wings in the hot oil and fry in small batches. Cook chicken until juices run clear. Place cooked chicken wings on a baking sheet and keep warm in preheated oven. Continue frying remaining chicken in batches and keep warm in oven. Once all chicken has been fried, place in a large serving bowl. Combine together the reserved marinade, melted butter and hot sauce. Toss with chicken wings to coat and serve hot. I think I'm ready to eat the screen! Good job! delish. Do you think it's possible to bake these instead? Hi Ariana! To bake instead of frying, you can omit the step of dredging in cornstarch. Simply preheat your oven to 400 degrees. Remove the marinated wings from the bag and place on a baking sheet. Bake in the preheated oven for 20-25 minutes or until done. Enjoy! Approximately how many wings is 2lbs? I'm going to serving this as a side/snack as we're doing a pizza night... do you think this enough for 6 people? Lauren, depending on how hungry your guests are, for 6 people I would recommend doing 4 lbs of chicken wings, or double this recipe. Hope this helps!